San Francisco Architects, Eliza Hart and Stuart Wright just finished a kitchen remodel in an older home that needed a lot of attention. 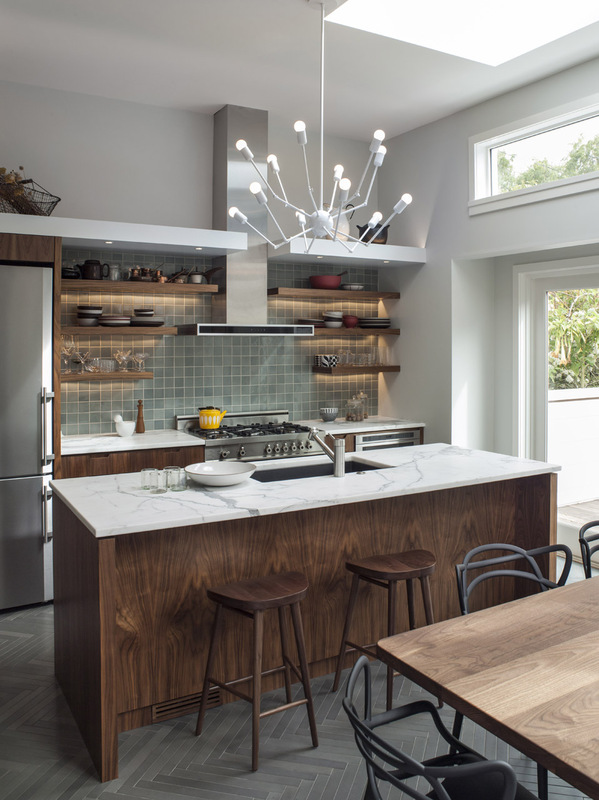 San Francisco architects Eliza Hart and Stuart Wright provided their clients with a new kitchen that they will love to cook and entertain in. Architects are presented with a lot of different projects throughout their careers. Some are challenging, some are straightforward, and some require a lot of creative vision to make something out of nothing. Creative vision is just what residential architects, Eliza Hart and Stuart Wright, had to use to create a beautiful kitchen where the was once just a barren room. They completed the kitchen remodel with the help of General Contractors Dijeau Poage Construction. 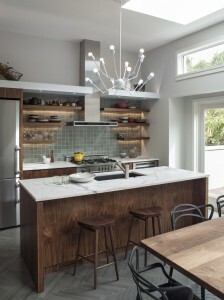 This renovation was completed early in 2012 for a young family in Cole Valley. The beautiful 1903 Victorian was in good condition but the room intended for the kitchen was comprised of nothing more than a sink, chimney and a five foot counter top. This space was clearly a room used by servants as there was a separate hallway to access it and a very small door that connected it to the dining room. Eliza and Stuart’s plan was to have better flow between these two rooms. One of the design challenges was to make the right transition between the two rooms, because their clients wanted the kitchen to be modern, and preserve the period details and trims in the dining room. To achieve this goal they trimmed the dining room side of the opening with matching traditional trim and the kitchen side of the opening with minimal 2 inch flat trim, the same that we used throughout the room. They made the kitchen bigger by designing a small addition and opening it onto the back yard with a deck and sliding patio door. An island with stools for seating and a window seat was added to this room. The sink is on this island and the stove and refrigerator are in a galley configuration along the back wall. To make the stove wall more open, free floating shelves with LED lighting were designed. Throughout the room linear uplighting from a unifying soffit provides ambient lighting. A lot of attention was placed on the materials used for this residential remodel. Clear walnut was chosen for the cabinetry with flat slab doors, and cool marble was picked for the counter tops, accented by a Heath tile backdrop. The floor is a stone tile from Ann Sacks. A new set of double hung windows, a skylight and clerestory window were also installed. The deck was constructed with simple wood post and horizontal cable railing and tropical hardwood decking. The kitchen remodel really pulls the house together, truly making it a home for the family to live in. Hart Wright Architects is a green architecture, urban and landscape design firm based in San Francisco serving clients in Palto Alto, Atherton, Napa, Mill Valley and most of the Bay area. Through all phases of design and construction, HWA is committed to excellence in architectural design solutions, active problem solving, and the highest standards of client service. They recently became certified DBE for being a woman owned business, and have moved their offices to a new location. 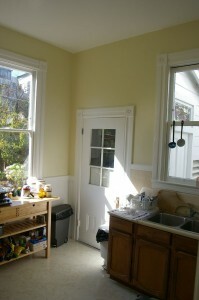 This was the state of the kitchen before San Francisco architects Eliza Hart and Stuart Wright remodeled it.